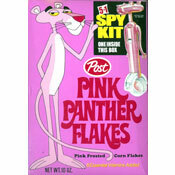 87 cereals start with the letter "P"
Post Cereals co-sponsored The Pink Panther Show, a Saturday morning kid's show, in 1972. This cereal was created as tie-in for that program. More Cereals That Start with "P"